Facilitating technology-focused professional development days takes strategic planning, follow-through, and skills. Recently, Milford and East Bridgewater School Districts collaborated on district-wide digital learning days that provided successful and impactful learning experiences for staff. Here are some strategies that came out of that experience. Get important stakeholders on board: It’s important to ensure that stakeholders such as the superintendent and even the school board are in the loop. Often those not in the classroom are quite impressed by the technology and the learning that’s happening. When teachers are sharing student successes using digital learning — on Twitter, by email to stakeholders, or directly at events—there will be increased support for such a full-day professional development opportunity. Once these stakeholders invest in active learning, you’ve cleared your first hurdle! Now, it’s on to our next, most important, group of investors in active learning: the educators. 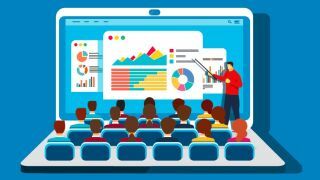 Select a planning team: It’s easy for users of digital tools to pontificate about 21st-century skills and the importance of technology However, a digital learning day should fit into a school’s mission and overall staff appraisal system. Having a wide range of talents and skill levels on your team will help create a well-rounded learning experience for your staff. This team will set the date, choose a venue, develop sessions, communicate updates to buildings, assist with publicizing, and be there when you just need to vent. Ask for educator input: We want our educators to feel involved and invested in their own professional development. Have the planning team ask principals, teachers, and staff what they would like to see offered at this district digital learning PD day. They can gather this information through surveys, feedback at faculty meetings, informal conversations, or through an open invite to email the team about their experiences with digital learning. Take their suggestions into consideration and add a variety of other opportunities, including sessions not suggested, to ensure sufficient differentiation. Design the day: Once your education staff has provided some input, let the planning and designing begin! Set goals: At the first team meeting, determine what you hope to achieve with the digital learning day. Start by aligning the conversations to the district goals to ensure your digital learning aligns with instructional expectations. As a team, explore how technology integration in teaching and learning fits within your district and supports your vision and mission. Identify needs and sessions: Once the goals are established, the needs of the learners should be identified. What do they already know? How do they learn? What do they not even know that they need to learn? This information can be gathered with a pre-survey or pre-screening questionnaire. Let attendees know that their input will help your team design a program that best fits their needs. Matching sessions to needs and learning styles will allow for deeper learning on the day of the event. * Workshops: In these traditional conference sessions, a presenter introduces and discusses an idea, shares something that has worked for him or her, or inspires the participants to try something new. * Expanded hands-on sessions: In hands-on workshops, participants can dig deeply into a topic, try out new ideas, and create or develop something they can use in their schools. * Panel discussions: A group of educators shares ideas or discusses a specific topic in front of participants and allows for Q&A. * Poster sessions: A poster session gives an opportunity for educators or students to share their work and examples in an informal context. All of the posters are set up at once, and each presenter stands with their poster throughout the session to answer questions from attendees. * “Round table” sessions: These are informal conversations centered around a specific topic or topics. This should not be a presentation but more of a conversation among educators with one moderator. The moderator provides leading questions to keep the conversation flowing. * Flipped sessions: Just like a teacher can plan a flipped class, you can try a flipped PD session. Participants will need to sign up in advance so presenters can provide online resources for them to view beforehand. Participants should come to the session prepared to engage at an informed level. Select a keynote speaker: Invite someone who will get people excited about the learning that is about to happen. A keynote speaker has the opportunity to take the staff on an intellectual and emotional journey that can propel them to a new place, help them see a new position, or set a positive tone for the day. Select presenters that match the needs: Often, we look outside our own schools for the brightest, and most well-known presenters. However, you can find great talent right in your own districts. Nothing helps active learning spread more than when one teacher creates buzz around a certain lesson. Promotion: Reach out to attendees, speakers, and prospective participants to get them excited about the event. For example, consider having presenters post promotional videos of their sessions to Flipgrid to get attendees excited about the program. Create a website, logo, and hashtag for your digital learning day and start promoting details about the event as early as possible. a cap for various sessions if your space requires it. This will also encourage attendees to register early in order to get the sessions they want. Decide when you will close registration and send reminders to attendees letting them know about important deadlines. to consider all dietary restrictions in your menu planning. Day of event: Provide a day-of-event checklist. *Dress comfortably but appropriately: In general, match your manner of dress to that of your attendees —or go slightly more professional. Make sure to be comfortable because as members of the planning team, you will be running around making sure the day is running smoothly. *Arrive early: Give yourself time to check last-minute arrangements and get yourself prepared for all sessions. *Check room arrangements (and numbers): Make sure the set-up is ideal for the training style you want to use in each space and make sure there are extra chairs for any last-minute attendees. *Check building temperature: Adjust it appropriately for the number of people who will be in the rooms and building. *Check audiovisual hardware: Conduct one last run-through to make sure everything is still running smoothly and all pieces are where they need to be. *Remember to have fun. A day like this takes a lot of planning and personal time, so enjoy the learning, excitement, and energy that your team’s efforts made possible. The best way to start to plan a digital learning day in your school district is to take the plunge and do it. We hope these strategies will support your planning, facilitation, and implementation of a successful day. When you implement these strategies, we would love to hear about it. Tweet us to share your successes.